I know for some of you the trip was inconvenient, taking your time off from work or just coming here in your free time, so we greatly appreciate it. Well, what can I say? We are gathered today in remembrance of Rusty Hearts, a good friend to some of us, a stranger or passing acquaintance to others, but overall a game that may have passed, but certainly left a legacy that will not be forgotten. What I know of Rusty Hearts is not extensive, by any means. I never achieved max level, nor did I play it often. However, it was a game that stayed installed on my hard drive because it was just fun. It was different. It refused to follow western tropes that felt like staples of the industry. It was a game that I played periodically, a game that, at the time, was unlike any other. In an age where ‘MMO action combat’ was a rare sight, and tab targeting and skillbars-for-miles was still the order of the day, Rusty Hearts bucked the trends. Instead of letting the player create their own character from scratch, they had predetermined characters with different playstyles. These were Rusty Heart’s classes. Most people feel that this is a black mark, that to snub open character creation is a sin against the genre. But, to me, this was just one reason that made it stand out. We see this now in a title like Marvel Heroes, a game currently in it’s prime, hitting it’s stride, but uses pre-determined superheros. 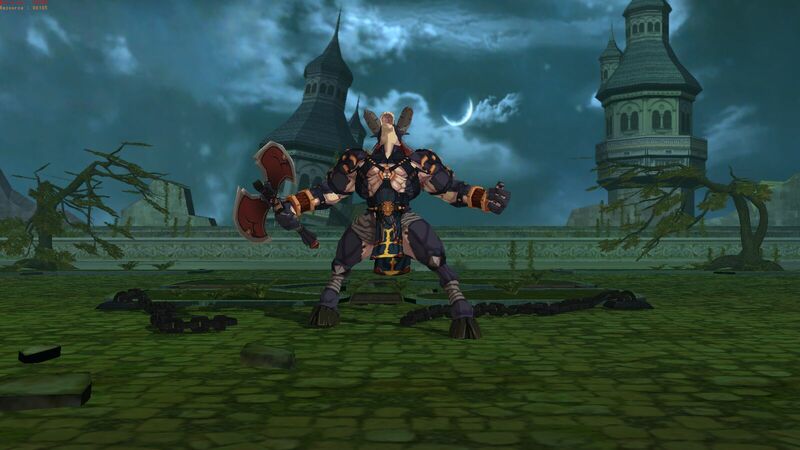 In Rusty Hearts, you wouldn’t play a melee dual-weapon class, you’d play Franz. You wouldn’t play a magic-wielding class, you’d play Angela. And you wouldn’t play a ranged dual-pistol class, you’d play Natasha. These characters weren’t just fluff, though. They were the main story. They were the characters who had a vengeance to exact against their enemy, the lord of Castle Curtis. The story was… interesting. I wouldn’t call it a great, memorable tale, but the comic relief came fast and furious, great contrast and companion to the fast-paced battles that were found within the game’s many, many dungeons. That, and the story matched the anime-like, uber-colorful and stylized art nicely. If you think World of Warcraft is “stylized”, you ain’t seen nothin’. 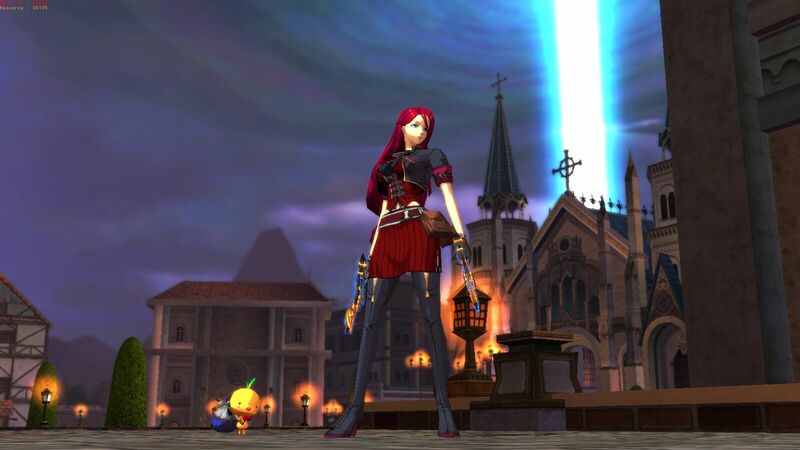 If anything, the style was similar to Champions Online. The music was unlike anything I’ve heard yet in an MMO to date, too. In the game’s main city, it was a sad-but-hopeful haunting classical/jazz piano with a bit of an electric flair, to match the town’s somber mood. Inside the dungeons, and when fighting bosses, it was faster paced club music, electric guitar and violins to match the fast action combat. Really, phenomenal stuff. I highly suggest you take a listen while it still remains on Youtube. Gameplay is where the game stood out, though, in my opinion. Sure, there wasn’t a lot of forced grouping or massive co-op gameplay that all the players today *think* they really want (but the numbers tend to prove them wrong time and again). It was a Guild Wars 1 or Star Trek Online style of lobby-based dungeon play, but it was a ton of fun. Mobs were thrown at you en masse and the short dungeons weren’t fully cleared until you beat a boss monster with harsh mechanics. The faster it was cleared, the more rewards were achieved, and rewards dropped like it was ‘National Loot Day’. However, the grind. Oh the grind. Rusty Hearts makes most MMO’s grinds look like a walk in the park. You didn’t just run these dungeons once, you ran them about 15+ times each, quests telling you to head right back in after you just came out. That’s why I never achieved max level or made a serious play at endgame, the grind was just too much. Rusty Hearts is succeeded, though, by a game that is still finding it’s place in the gaming world, Neverwinter. Not so much the art style or music, but in the gameplay. The characters are very stock types, the play is lobby based, albeit a little more open, but the action and bosses fought at the end of each dungeon are not exact, but reminiscent of the gameplay. An offspring, if you will. If you enjoy Neverwinter, there’s a decent chance you would’ve enjoyed Rusty Hearts. So closing mere days before it’s third birthday, which would’ve been September 20th, with a heavy heart we say goodbye to Rusty Hearts. A game with ideas before it’s time, but holding fast to old grind tenets. A game with great style, both in art and music, and gameplay that was just plain fun. Rusty Hearts was the game that really opened up my eyes to what could be different about MMOs, but still be fun to play. It smashed the idea that MMOs had to stay to a strict formula, that the term MMO was a lot broader than I believed it to be. It pretty much is the reason for my game-jumping. I learned from Rusty Hearts to expand my “comfort zone”, to try out and give each game it’s own fair attempt to see if I liked it or not. To not just blindly follow the crowd. You can say Rusty Hearts is then partially a reason why I started this blog, to share my thoughts that there can be good things in places you might not usually look. Now please, for all those in attendance, there will be a repast held at the community hall down the street. All are welcome to attend. Remember Rusty Hearts the next time you see a game and think “that’s not for me”. You never know. All you have to do is try it out. Rusty, you will be missed. This entry was posted in MMO and tagged Angela, anime, Champions Online, Franz, Marvel Heroes, Music, Natasha, Neverwinter, Rusty Hearts by Ocho. Bookmark the permalink. That said, I’m sorry to hear you have to say goodbye to a game you enjoyed. MMOs are great, but you can’t depend on them to be around forever. Reminds me to carpe diem.